a series of paired branchial grooves. The branchial grooves are matched on the inside by a series of paired gill pouches. In fishes, the pouches and grooves eventually meet and form the gill slits, which allow water to pass from the pharynx over the gills and out the body. In the other vertebrates shown here, the grooves and pouches disappear. In humans, the chief trace of their existence is the eustachian tube and auditory canal which (interrupted only by the eardrum) connect the pharynx with the outside of the head. The idea that embryonic development repeats that of one's ancestors is called recapitulation. It is often expressed as "ontogeny recapitulates phylogeny"; that is, embryonic development (ontogeny) repeats phylogeny (the genealogy of the species). This is a distortion of the truth. It implies, for example, that early in our embryonic development we go through a fishlike stage. We do not. Rather, we pass through some (not all) of the embryonic stages that our ancestors passed through. 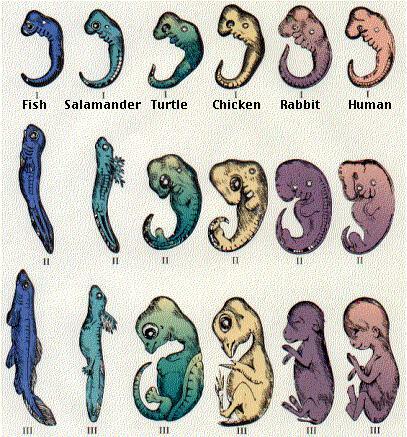 Therefore, we find that the more distantly related two vertebrates are, the shorter the period during which they pass through similar embryonic stages (fish and human) and vice versa (fish and salamander). We should also keep in mind that embryonic development prior to the pharyngula (stage I) may also be very different in the different groups. For example, while the pharyngulas of the human and the salamander look quite similar, their earlier development, starting with their fertilized eggs, are very different [illustration]. The idea that "ontogeny recapitulates phylogeny" was proposed over a century ago by the biologist Ernst Haeckel. He also made the drawings on which the drawings above are based. Periodically, people rediscover that in making them, he altered certain details to emphasize his theory. Though they are schematic, the story they illustrate here has stood the test of time. Fossil evidence suggests that the ancestors of the insects had a pair of legs on each of their body segments. 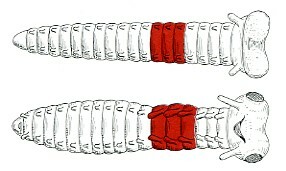 In this, they resembled today's millipedes (which may represent a second line of descent from these early forms). In any case, during embryonic development of insects, limb buds appear on the abdomen just as they must have in their multilegged ancestors. But by the time the larva hatches, only the six legs on the thorax (color) remain. The ones in the head become mouth parts. The ones in the abdomen disappear. Both these changes appear to be controlled by the expression of HOX genes. Fish excrete a large part of their waste nitrogen as ammonia (NH3), while amphibians have the less toxic urea as their nitrogenous waste. Actually, the fish-like tadpole excretes ammonia until it undergoes metamorphosis into the adult frog. Only then does its chief nitrogenous waste become urea. As for reptiles and birds, they convert their waste nitrogen compounds into the almost insoluble uric acid. 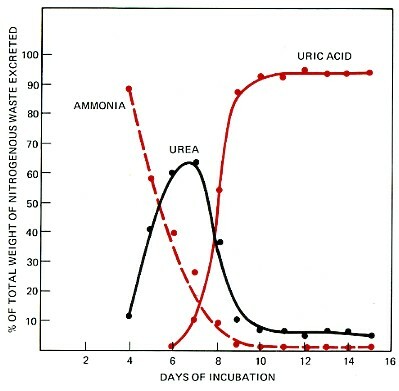 During its development within the egg, however, the chicken embryo first passes through a stage of ammonia excretion followed by a period in which it excretes urea before finally turning to uric acid.